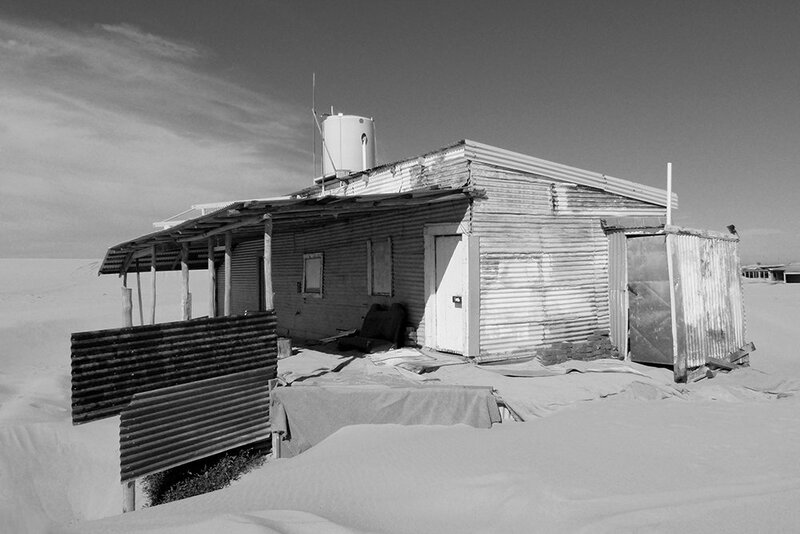 Yesterday I posted a photo of one of the shacks at Tin City on Stockton Beach. Here is another of the shacks still standing. There are 11 shacks remaining at Tin City and if storms demolish any of them they aren't able to be rebuilt. For anyone who missed the photo I also attached a couple of links telling you about Tin City, here are the links again if anyone wants to check it out. Well not exactly crawling, she was actually taking a photo of sand, ha ha. Wow what hardy souls they must be to live permanently in these shacks. So interesting - thanks Babs for sharing this information. Great image telling a story!! great spot, not sure I'd choose to live there though. B&W is great, and sepia might be interesting. A wonderful shot of this abode and great in b/w as the corrugated iron sheets really stand out well - and so sand proof !!!! Fav. Another fascinating image. In b&w the dunes look like everywhere is covered with snow. This is really atmospheric Babs. Glad you are going from strength to strength. Great capture. I must be hot living in these houses. Very interesting links on Tin City. Amazing anyone can live comfortably in a tin oven! @pamknowler I think 4 of the 11 shacks are occupied permanently and the rest just go there at weekends etc. @pusspup I couldn't live there either, it is a hell of a hike to the supermarket. @gilbertwood @pistache @rustymonkey @blueberry1222 @brennieb @seattlite @bkbinthecity @pcoulson @mandygravil @samae @madeinnl @claudiet @henrir @craftymeg I shudder to think how hot it would be in summer. I think this particular shack is just used as a weekender, but four of the shacks are occupied permanently. @casablanca It will be boiling in summer but only a stones throw from the ocean so at least they can have a dip to cool off. @brigette I think this particular shack is used as a weekender, but some of the shacks are occupied permanently. @beryl Not so sure about being sand proof, sand gets everywhere. When there has been a huge storm this shack will be almost buried and the owners will have to dig their way in. @sangwann It does look like snow doesn't it. Our sand is so fine and white. It just looks so stark and uncomfortable from the outside but I guess they make it more cozy on the interior as shown in the videos. But still- not the most desirable real estate to own. And I would feel awful if they lost everything in a storm and had no place to go with no opportunity to rebuild. Good black and white though- really emphasizes the sandy conditions! That's so interesting! Great capture. Looks very desolated. What will they do with it? Wow that is a lot of sand! It is really neat looking. Great shot. @olivetreeann not for me either, you wouldn't want to run out of groceries would you. @pyrrhula It is the perfect place if you like isolation and a great spot for fishing. Is that a massive hole bottom left of the shot? I couldn't live there, I'd be tripping over my own feet the whole time! @psychographer The sand shifts all the time so holes appear and disappear. this is a great image. Those two sheets of corrugated iron acting as leading line taking us to the front door, with the shaft of light on it. Brings a bit of life and suggestion of the possibility of action in the scene.